I am pleased to confirm that Trend Marine have been the primary glazing and patio door supplier to Sunseeker International Ltd. for more than 30 years. As Sunseeker International Ltd. have developed and grown, Trend have been on hand to support new designs and provide expertise and technical advice. Their global technical aftersales support can be relied on to assist with any maintenance. Sunseeker International Ltd. are proud to work with British businesses. Trend Marine Products were commissioned by yacht project management consultants Alchemy projects to provide replacement saloon windows for the Frers 60 sailing yacht Namaqua. Trend Marine Products undertook a detailed laser scan survey of Namaqua and manufactured new made-to-measure toughened safety glass replacement windows. The new glass windows were installed on board Namaqua without any further input from Alchemy Projects or the yacht’s Owner. The Trend Marine installation team acted professionally and independently for a turn-key service. Alchemy Projects and the Owner of Namaqua are happy to endorse the work and customer service of Trend Marine Products and would recommend them for future refit projects, both sail and power. Trend Marine Partners with Smart Locks for Yachts at METS 2018. Trend Marine are excited to announce an exciting and exclusive partnership with Smart Locks for Yachts. A simple and effective encrypted smart locking solution that can be fitted to both exterior and interior doors on almost any vessel. With the simple swap out of the standard Euro or Trioving cylinder locking system, ‘SL4Y’ enables the owner or captain to control access from a central point on board or do so remotely without extensive refit. Downloading access logs, opening or locking down certain areas on the vessel or simply removing the need to use an old-fashioned key and lock systems. With various packages available, Trend Marine are delighted to be working with this exciting new project and will be promoting an upgrade to our existing patio door systems that exist in the field. In addition, we will be supplying the system as an upgrade to OEM customers with new doors produced from our Norfolk manufacturing facility. At METS 2018 Trend Marine Products will have an example of the basic keyless system on the stand, and we look forward to sharing this exciting product development with you. Iain Davie – Smart Locks for Yachts CEO commented “Having developed our Smart marine locking systems to suit all aspects of yacht access control over the past three years, we are looking forward to the next stage of our brand development in an exclusive partnership with Trend Marine, an international leader in the design and manufacture of marine doors and glazing products. It is the perfect fit, our innovative smart locking systems and the manufacturer of so many of the marine doors we have been fitting them into. Trend Marine are globally renowned for their quality and innovation in design, we are very excited to include our smart marine lock solutions within their catalogue of marine doors”. 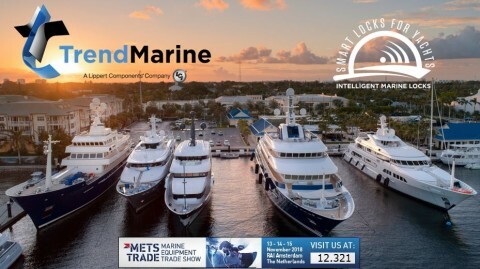 We look forward to demonstrating our Smart Marine Locks alongside Trend Marine at METS 2018. Our flush bonded Sargasso Opener system. A brand-new glazing display to showcase our current investment in manufacturing technology to supply our customers with the smart glazing systems of the future. For more than 40 years Trend Marine have been the industry’s leading manufacturer of high-quality marine glass and glazing products for both yachts and Superyachts. Backed by state-of-the-art glass technology systems, Trend Marine has built an international reputation for designing, manufacturing and installing marine glass and glazing products of unsurpassed excellence. Trend Marine Products’ Superyacht division are pleased to report an incredibly busy 2018 Monaco Yacht show. With a small stand at the show and a number of engineered glazing products on the stand, the team were pleased to welcome old and new customers. 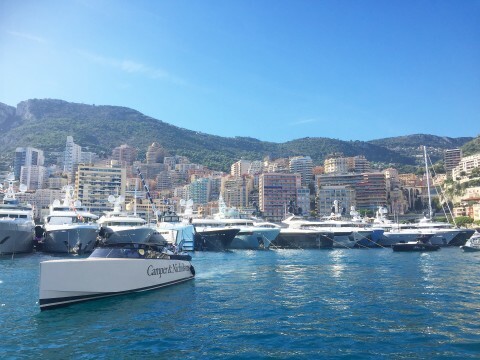 The Monaco Yacht show attracts the who’s who of the Superyacht industry, with Brokers, Project Managers, Owners and Crew all in Port Hercule for a week of networking. We are delighted to report on a number of key international refit enquiries, and some superb feedback from existing customers within the Superyacht Sector.With some exciting projects in the pipeline, it’s sure to be a busy period for Trend Superyacht.